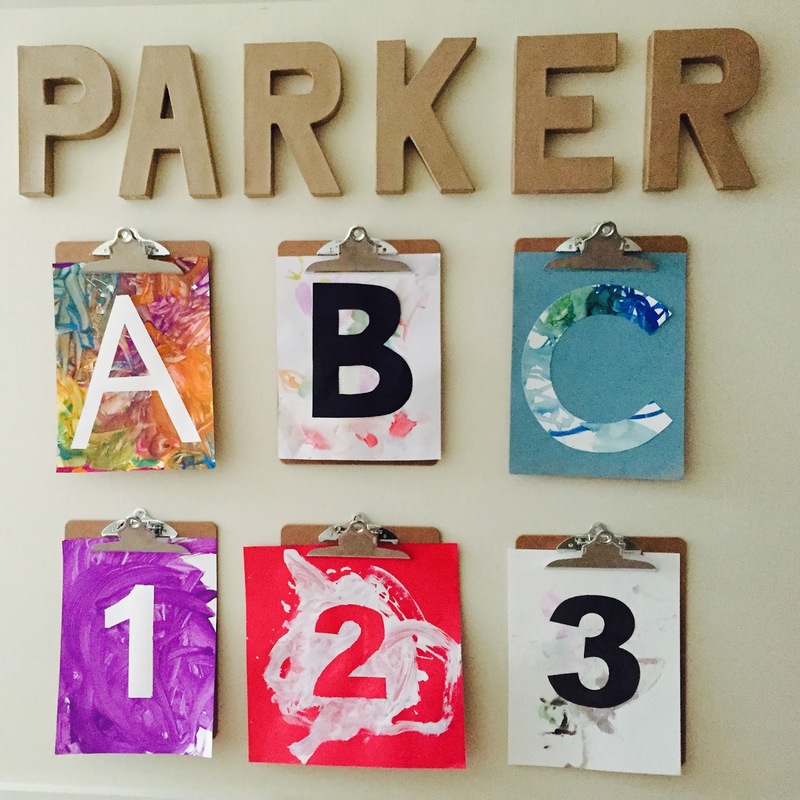 I mentioned awhile back that Parker is mildly obsessed with letters. It started with his love of stop signs when he was just months old. It progressed to yield signs, and exit signs, and he wowed us with his ability to identify the letters on all of these signs after simply listening to us recite them. Right now, he's kind of in love with his own name. If asked who he is, he'll reply "K-E-R, Pah-kah!" (for some reason he only latched on to the last three letters, but he's two so we'll take it - he also sounds like he's from Boston when he says his name and it's adorable). Being a former elementary school teacher, I wanted to jump right in with letter/sound combinations, and link letters to words. I realized this was a bit ambitious, because again, he's two, so I decided on a lesser but more attainable goal: Identification of Uppercase Letters. Parker actually already did very well with about half the alphabet (10-12ish uppercase letters) just from his innate curiosity. He was truly leading his eduction, so these letters were random: E, X, I and T from the exit signs, V from a nightgown I wear, S, T, O, and P from stop signs, C from Costo (his favorite place) and so on. I decided I wanted to cover the entire alphabet, introducing the letters he doesn't know and reinforcing the familiar ones, and we'd do so with an art project for each letter. At the end, I'll bind them into a book, but for now we hang them on Parker's wall as we complete them. We've been mixing it up for our art projects. Sometimes I'll have Parker watercolor and then I'll cut out the letter (like above) but his very favorite thing to do is masking tape art. 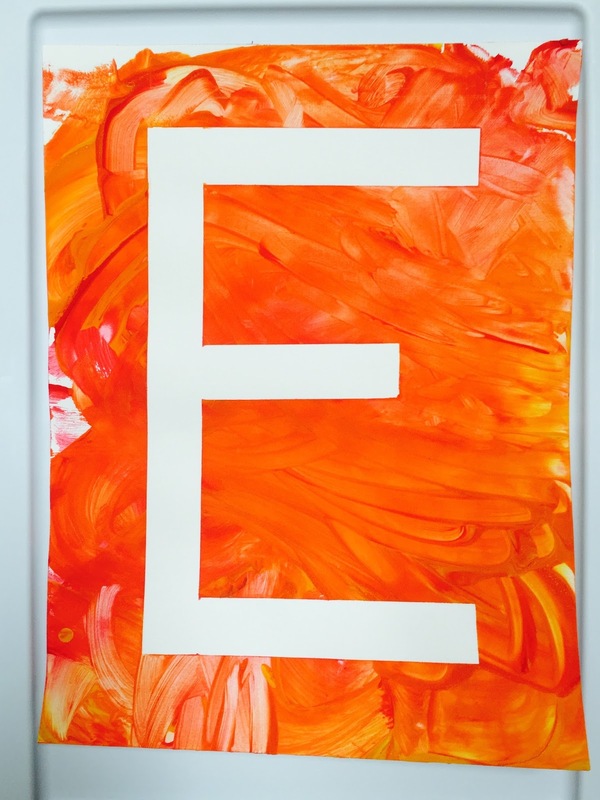 I start with art paper and use painter's tape to make the letter we're working on (or number as in the example below). For tricky ones like this, I use lots of little pieces of tape (OCD much?). Block letters like uppercase A's and E's are much, much easier to make. 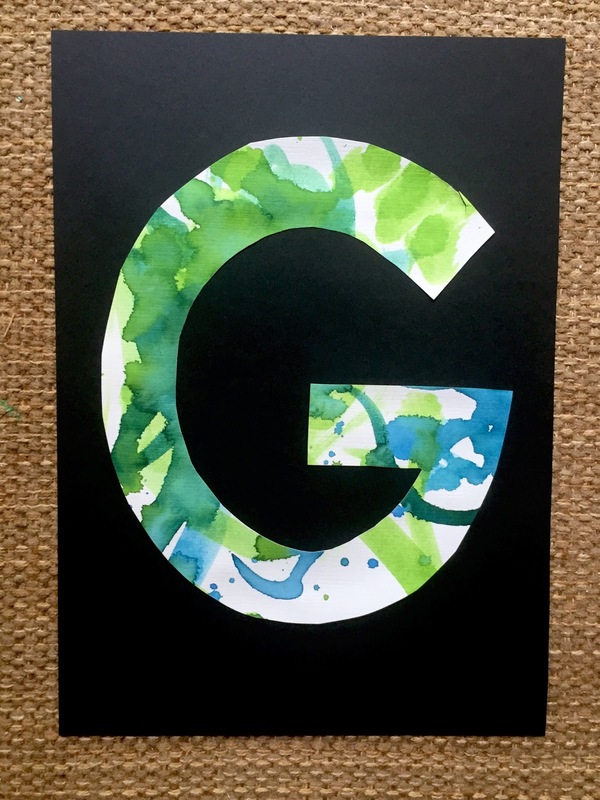 I let Parker choose his own colors to work with, and then I just pour the paint right onto the paper (this helps ensure enough paint gets on to completely cover the number or letter, which is the goal). Parker loves using the brush to cover up the letter (or number). 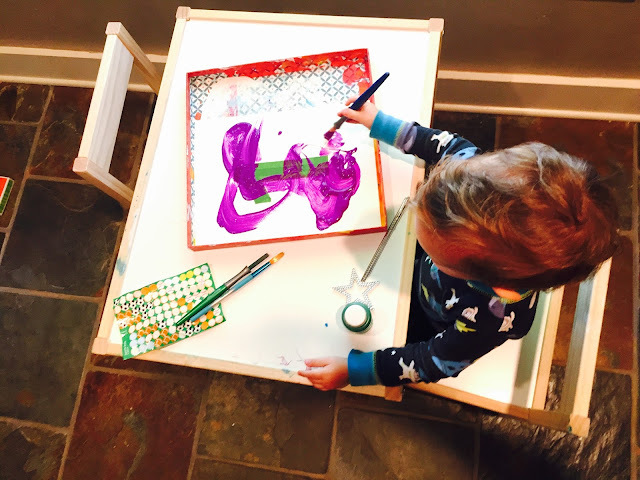 I always like to have a space set aside for his art to dry (old boxes or newspaper ads are perfect for that - just remember to set it up before you get started!). Or, take it all outside, my favorite! With the summer heat, though, this is really only an early morning option for us. "Bye, bye, E! Bye, bye, E!" 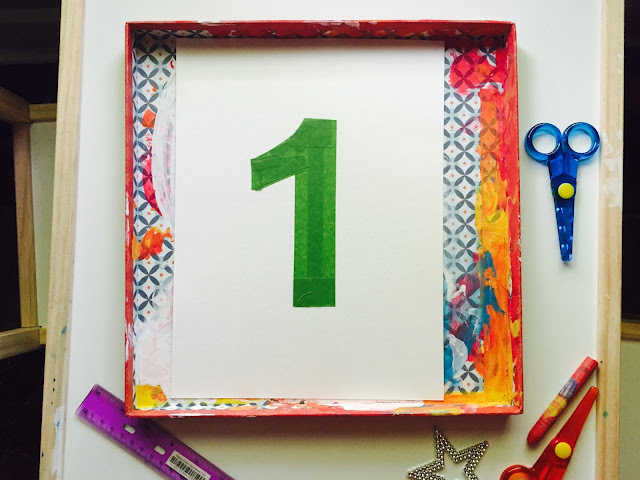 Once the paint is dry, just peel up the tape and you'll be left with the letter or number! So fun! Thank you for sharing the links for the materials that you use. 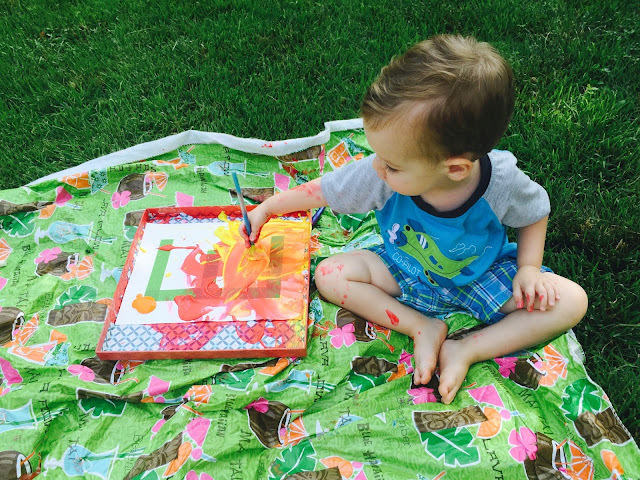 Our son is 17 months and he is loving painting right now so it will be nice to order some different types for him to play with as well. He is also loving adding Melissa and Doug stickers (it's a large pack of hundreds of themed stickers) to the top of his art work. The liquid watercolors are my favorite find! They are much easier for little ones to use versus the traditional watercolor cakes. You are starting young with your kiddo - I love it!! Ok you are a total genius and I need you to be my neighbor so we can do these (and your rainbow color box idea) together!! 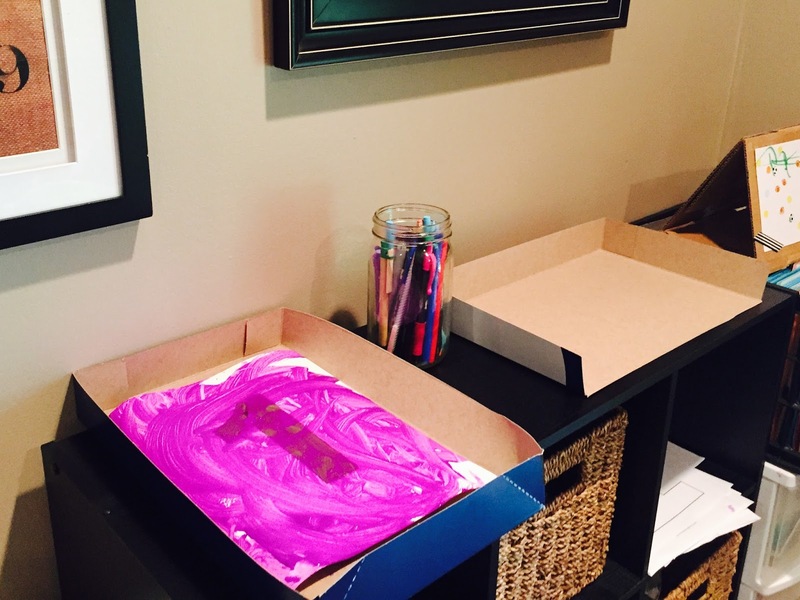 It looks like you have him painting INSIDE a box? How incredibly clever and I will now be doing that with Ellie - which will allow her much more painting opportunities as this seems to be a much cleaner option than anything I have ever thought of!! You are just awesome!! Awww, thank you! Yes, good eye spying the box - it's a life changer!! I originally had Parker use it as his "table" when we were on the grass, but it's just as useful inside, too. I keep reusing the same one over and over - it's a 12x12 that came with craft paper inside it. Upcycle for the win!